Sometimes I get so caught up in my technology-filled world, something brings me back and reminds me that- most of America isn't listening to podcasts every morning. Most of America isn't checking their "reader" and sharing their resources on Twitter. While I do know this, sometimes I come across something that hits me like a ton of bricks. It tells me: we're not there yet. We have a long way to go. 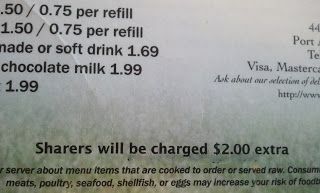 This weekend, at a breakfast stop during my weekend camping trip, I saw this little sentence at the bottom of my menu: "Sharers will be charged $2.00 extra." I sat hard with that sentence as my old friend and I gobbled up our waffles. How do you approach a mindset like that? How do you make one a believer in the possibility of collaboration, of innovation, when their mindset is to punish those who try? At the end of the meal, I was curious about how the bacon tasted, and I thought I might actually get in trouble for asking my friend for a bite of his. "...those deeply committed to old solutions cannot see how society would benefit from an approach incompatible with older models." "We can't ask people running traditional systems to evaluate a new technology for its radical benefits. People committed to keeping the current system will tend, as a group, to have trouble seeing value in anything disruptive." In both sentences, I'm not sure by accident, the key word is: see (or seeing). Very often the people holding us back from progress, literally, have trouble with vision- in the broader sense of the word. Those who have "found" salvation, have no need for vision, as they need not "look" any further. The man who owns the restaurant lacks the vision for seeing how allowing two people to share a meal, might actually improve business. Maybe by allowing it, he creates a new business model, maybe he goes to a family style menu, or maybe folks, seeing his values, decide to frequent there more often. As I think about education in a broader sense, this year, I'll try to keep in mind- I cannot make people see like I do. But I can provide a vision- of education- enhanced by technology, and streamlining the process of learning. I'll just keep trying to ease folks into it- one bite at a time.